The world of Ultrarunning has a shortage of decent books and articles due mainly to the size of the participating population and the related lack of interest in funding for the scientific community to indulge in further research. Books such as UltraMarathonman by Dean Karnazes and Born to Run by Christopher McDougall have made a significant impact on our little researched pursuit of running beyond 26.2 miles. I always have a book on the go and given the limited topic relevant resources I am getting the point where the links to ultrarunning are getting more tenuous, but are still worth a read. Every now and then I will post reviews of whatever I read be it formal instructional material to the purely inspirational stories of individuals achievements. The first book I would like to mention falls in the latter class, as a biographical account of the emotional and physical experiences of Pat Farmer – an ordinary Sydney guy who wanted to become the best ultra runner in the World. 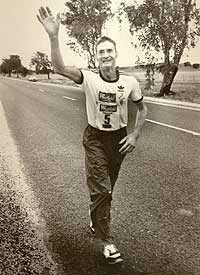 “The Pat Farmer Story - Running on a Dream” was written by Ian Eckersley, who so far as I am aware is not a runner himself, and this shows in the content of the book. The focus is on the achievements and the dedication of Pat Farmer, and has very little in the way of tips, tricks and statistics that the average ultrarunner is looking for. That said it is an inspiring account, and well worth a read. I finished the book thinking I could achieve anything if I was to put my mind to it, and that perhaps I should consider crossing a continent on foot! You can’t help but be inspired by a guy who got into running after seeing the legendary Cliff Young (pictured right) go past the garage he was working in, and then declare that he was going to enter the Westfield Sydney-Melbourne (875kms) race the following year. The book follows the ups and downs of his life based around his running achievements. I had never heard of him, and when you look at his achievements, it makes you wonder what you have to do to get famous in this sport (a topic of a future blog). His dedication is something to aspire to as ultimately he gave up his job to pursue his dreams, which included a very strong family commitment. In the process he was a great ambassador for his sport, for his country and he raised millions for charities. His achievements include twice competing in the Trans-American race finishing 2nd and 4th, twice traversing the punishing Simpson Desert in Australia, he ran up and down the Sydney Tower stairs for 24hours climbing over 100,000 steps (earning another world record), and he finally hung up his ultrarunning shoes following a 191 day run around Australia where he ran over 14,500kms averaging about 80kms a day without a day off. This somewhat overshadows the achievement of Dean Karnazes 50 Marathons in 50 Days , which is impressive in itself. I've since learnt that he is now training to run from the South to North Poles starting later this year. 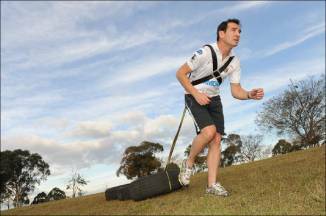 The picture above shows him training with a few tyres in tow for good measure. Much like Karnazes’ books I finished "Running on a Dream" thinking that I can relate to this guy and asked myself why I can’t go out and do the same things myself. Of course there is only one way to find out! You may have noticed that my running training has taken a bit of a vacation for a number of reasons, mainly down to a fair amount of physical work (hence a almost justifiable excuse for not needing to run). So I got back into the swing of things with a gentle 3 and half hour trail up and down the local hill 3 times (a first for me). I should be back into the swing of things soon and look forward to sharing more of what I am learning. Dear Angela, I am sorry you have chosen to comment in such a way as I did attempt research in to Ian's background before I made the comment "who so far as I am aware is not a runner himself" as I was unable to find any mention of Ian's achievements or background. This is intended to be an informative blog about the world of ultramarathons which I write because of my interest in the sport, and is indeed a labour of love for me too. There is no doubt that Ian is a good journalist, and that is a reflected in him writing about Pat and not himself, after all the story was intended to inspire, which is exactly the point of my post. My comment about tips is by way of review to inform other runners of what they can expect from this excellent book. My posting gives a clear endorsement for Ian's work and Pat's achievements and it is a direct result of reading this book that I have committed to running 1400km across the Nullarbor Plain to raise $50,000 for two charities close to my heart. I could not agree more with you when you say it is an inspiring story that needed to be told, as I had no awareness of any of Pat's achievements prior to reading the book. The purpose of my article was to raise awareness of this, and hopefully increase support for his current challenge of running Pole to Pole. My apologies again for not being aware of Ian's running pedigree, which I would love to learn more about. I do try to write to the best of my ability with the information I have available to me. I am not an investigative journalist, and unlike many people who blog about their running, I take care and spend a great deal of time on planning and structuring my posts to be informative and beneficial to others who share my interest.